From left are Jiuk Jang, Professor Jang-Ung Park (School of Materials Science and Engineering), Joohee Kim, Jihun Park, Young-Geun Park, So-Yun Kim, and rofessor Franklin Bien (School of Electrical and Computer Engineering) at UNIST. Their work has been published in the January 2018 issue of Science Advances. A new biosensing contact lens that detects glucose levels in tears. A team of researchers, affiliated with UNIST has recently introduced a new biosensing contact lens capable of detecting glucose levels in patients with diabetes. 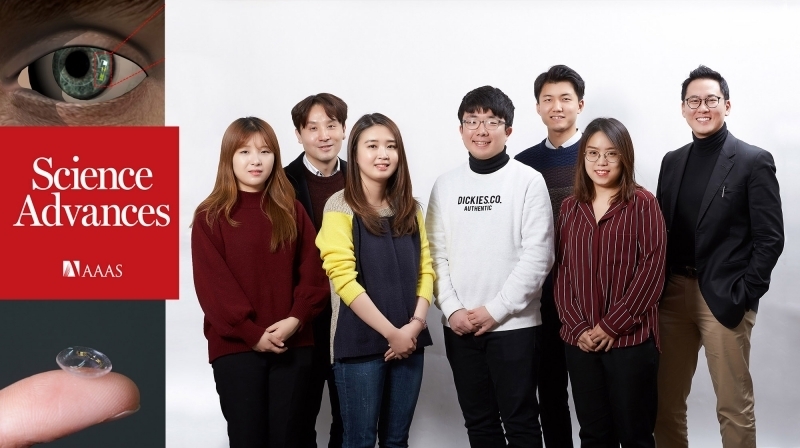 This breakthrough has been jointly conducted by Professor Jang-Ung Park in the School of Materials Science and Engineering and Professor Franklin Bien in the School of Electrical and Computer Engineering at UNIST in collaboration with Professor Jung Heon Lee in the School of Advanced Materials Science and Engineering at Sungkyunkwan University. According to the research team, this innovative smart lens with built-in pliable, transparent electronics can monitor glucose levels from tears in the eye. The device has not yet been tested in humans. However, the research team expects that the release of this device will offer diabetics a pain-free way to measure their glucose levels with the blink of an eye. Their findings have been published in Science Advances, on January 25, 2018. For patients with diabetes, monitoring and controlling blood sugar levels are extremely important because having high blood glucose levels for extended periods of time can lead to a host of diabetes complications. An enzyme based finger-pricking method is the most commonly used technology in diabetic assessment. However, such approach has been said to reduce compliance among diabetic patients. 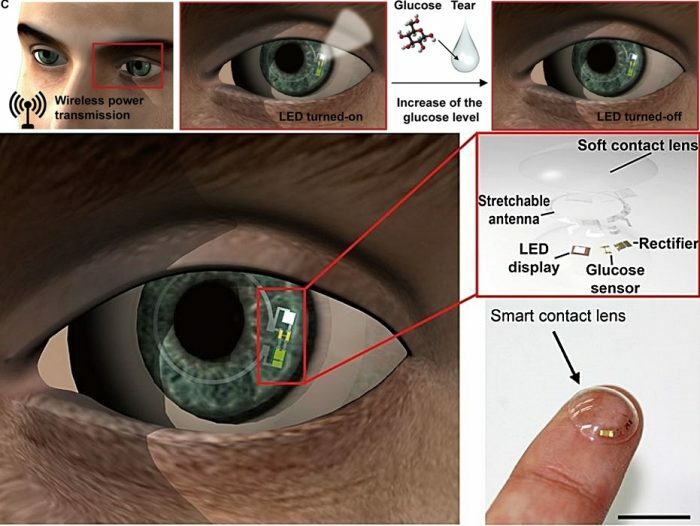 In the last several decades, many attempts have been made to monitor glucose levels in tears with smart contact lenses, but they are often not used due to poor wearability. To solve contact lens discomfort issues, Professor Park and his research team have unveiled a new smart contact lens that uses electrodes comprised of highly stretchable and transparent materials. This clear, flexible lens also contains a glucose sensor that sends electrical signals to an LED. With this sensor, patients can transmit their health information in real-time using the embedded wireless antenna in the lens. The new smart contact lens, capable of monitoring glucose levels in tears. As shown in the figure below electric power that activates the LED pixel and the glucose sensor is wirelessly transmitted to the lens through the antenna. After detecting the glucose concentration in tear fluid above the threshold, this LED pixel turns off. In the study, the research team has successfully tested their prototype lens on a live rabbit via non-invasive in-vivo testing. The rabbit showed no signs of abnormal behavior during repeated eye blinks and the LED pixel turned off when tear fluids with glucose concentration was over the threshold. In addition, during the wireless operations, this smart contact lens could still maintain the eye temperature stably without abrupt heating. “The in vivo tests using a live rabbit … provided the substantial promise of future smart contact lenses for noninvasive health care monitoring using human eyes and tears,” says the research team. He adds, “We are now a step closer to the implementation of a fictional idea for a smart contact lens in the films, like “Minority Report” and “Mission: Impossible”. Jihun Park, et al. “Soft, smart contact lenses with integrations of wireless circuits, glucose sensors, and displays”, Science Advances, (2018).